Rohlman R, Campo S, Hall J, Robinson EL, Kelly KM. What could Total Worker Health® look like in small enterprises? Annals of Work Exposures and Health. Campo S, Kelly KM, Rohlman DS. 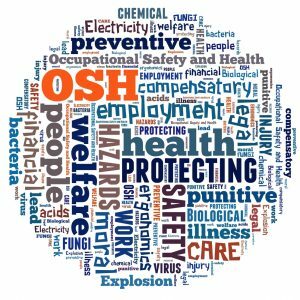 Occupational safety, health, and well-being programs in small Midwest enterprises. In: HL Hudson, JAS Nigam, SL Sauter, LC Chosewood, AL Schill, J Howard (eds), Total Worker Health: Integrative Approaches to Safety, Health, and Well-being. Ekenga CC, Pérez M, Margenthaler JA, Jeffe DB. Early‐stage breast cancer and employment participation after 2 years of follow‐up: A comparison with age‐matched controls. Cancer. Rohlman DS, Parish MA, Hanson GC, Williams LS. Building a Healthier Workforce: An Evaluation of an Online Nutrition Training for Apprentices. Journal of Nutrition Education and Behavior. Doney BC, Henneberger PK, Humann MJ, Liang X, Kelly KM, Cox-Ganser JM. Occupational Exposure to Vapor-Gas, Dust, and Fumes in a Cohort of Rural Adults in Iowa Compared with a Cohort of Urban Adults. MMWR. 66(21): 1-5. Hall JL, Kelly KM, Burmeister L, Merchant JA. Workforce Characteristics and Attitudes Regarding Participation in Worksite Wellness Programs. American Journal of Health Promotion. 31(5): 391-400. Carr LJ, Leonhard C, Tucker S, Fethke N, Benzo R, Gerr F. Total Worker Health intervention increases activity of sedentary workers. American Journal of Preventive Medicine. Schall M, Fethke NB, Chen H. Working postures and physical activity among registered nurses. Applied Ergonomics. Schall MC, Fethke NB, & Chen H. Evaluation of four sensor locations for physical activity assessment. Applied Ergonomics. Snetselaar L, Ahrens L, Johnston K, Smith K, Hollinger D, Hockenberry J. A participatory integrated health promotion and protection worksite intervention: A cluster randomized controlled trial. Topics in Clinical Nutrition. Anger WK, Elliot DL, Bodner T, Olson R, Rohlman DS, Truxillo DM, Kuehl KS, Hammer LB, Montgomery D. Effectiveness of total worker health interventions. Journal of Occupational Health Psychology. 20(2):226-47. Elliot D, Rohlman D, Parish M. Focus groups move online: Feasibility of Tumblr use for eHealth curriculum development. Journal of Medical Internet Research Protocols. 4(1):e34. PMID 25831197. Green DR, Anthony TR. Occupational noise exposure of employees at locally-owned restaurants in a college town. Journal of Occupational Environmental Hygiene. 12(7):489-499. Parish M, Rohlman DS, Elliot DL, Lasarev M. Factors associated with occupational injuries in seasonal young workers. Occupational Medicine. 10.1093/occmed/kqv183. White H, Khan K, Lau C, Leung H, Montgomery D, Rohlman DS. Identifying health and safety concerns in Southeast Asian immigrant nail salon workers. Archives of Environmental & Occupational Health. 70(4):196-203. PMID 25965322. Ramey S, Perkhounkova Y, Moon M, Tseng H, Wilson A, Hein M, Hood K, & Franke W (2014). Physical activity in police beyond self-report. Journal of Occupational and Environmental Medicine. 56(3):338-343. Rohlman DS, Parish M, Elliot DL, Montgomery D, & Hanson G (2013). Characterizing the needs of a young working population: making the case for Total Worker Health in an emerging workforce. Journal of Occupational and Environmental Health. 55(Suppl. 12S):S69-S72. Fethke NB, Merlino L, Gerr F. Effect of ergonomics training on agreement between expert and nonexpert ratings of the potential for musculoskeletal harm in manufacturing tasks. Journal of Occupational and Environmental Medicine. 55(Suppl. 12S):S82-S85. Franke W, Ramey S. Stress and cardiovascular disease in law enforcement. In Miller, MK & Bornstein, BH (Eds). Trauma, Stress and Wellbeing in the Legal System (1st Ed.) New York: Oxford University Press. Hudson H, Hall J. Value of social media in reaching and engaging employers in total worker health. Journal of Occupational and Environmental Medicine. 55(Suppl. 12S):S78-S81. Loeppke RR, Schill AL, Chosewood LC, Grosch JW, Allweiss P, Burton WN, Barnes-Farrell JL, Goetzel RZ, Heinen L, Hudson TW, Hymel P, Merchant J, Edington DW, Konicki DL, Larson PW. Advancing Workplace Health Protection and Promotion for an Aging Workforce. Journal of Occupational and Environmental Medicine. 55(5):500-506. Merchant JA, Lind DP, Kelly KM, Hall JL. An employee total health management-based survey of Iowa employers. Journal of Occupational and Environmental Medicine. 55(Suppl. 12S):S73-S77. Cherniack M, Henning R, Merchant JA, Punnett L, Sorensen GR, & Wagner G (2011). Statement on national worklife priorities. American Journal of Industrial Medicine. 54(1):10-20. This report provides an overview of key provisions of the Affordable Care Act that impact prevention and wellness. The focus was on the fundamentals of individual and employer-offered coverage, the current situation in Iowa, and the implications for small businesses. A policy strategy is outlined to address the current and anticipated challenges to improved wellness and prevention efforts. The report was developed by the State Public Policy Group, Inc., a West Des Moines, Iowa company in partnership with the HWCE. a population-based survey of Iowans with a primary goal of identifying health needs, priorities, and opportunities of the Iowa workforce and other Iowa voters. Healthier Workforce Center for Excellence produces nutrition video. HWCE- Featured, UI College of Public Health News Digest, Feb 19, 2016. 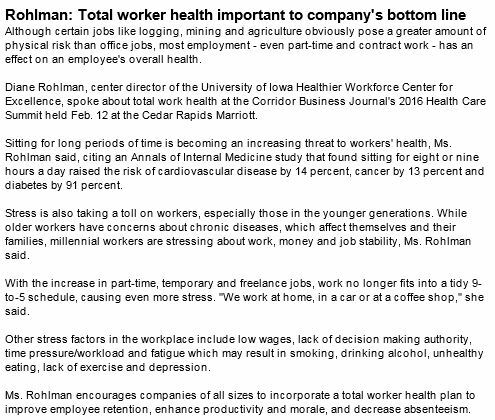 Rohlman: Total worker health important to company’s bottom line. Dr. Diane Rohlman- Featured, Corridor Business Journal Health & Wellness Watch, Feb. 15, 2016. Efficacy of a Combined Ergonomic Health Promotion Intervention on Employee Health (findings from HWCE project). Dr. Lucas Carr- Featured in over 100 news outlets including The Atlantic, Yahoo News, Christian Science Monitor, Consumer Reports on Health, and Science Daily, 2015. People Who Stand At Work Burn More Calories. Dr. Lucas Carr- Featured, Iowa Public Radio, Dec. 17, 2015. Healthier Workforce Center for Excellence. HWCE- Featured, American Society of Safety Engineers Health and Wellness Branch Newsletter, Oct. 2014. Prevention Worth More than the Cure. Dr. Jim Merchant- Op-Ed, Corridor Business Journal, Sept. 1, 2014. Are Company Wellness Plans Good for Your Health? Dr. Jenny Hall- Quoted, MORE Magazine, July/August, 2014.